Scapular stabilization exercises are an important aspect of the prevention of swimmer’s shoulder, one of the most common swimming injuries. The strengthening exercises in this article will allow your scapula (shoulder blade) and shoulder joint to remain stable during the overhead arm movements as they occur in the different swimming strokes, and thus prevent shoulder problems. By the way, these shoulder exercises aren’t for swimmers only but can be used by anybody that wants to strengthen his or her scapular stabilizers. 1) The exercises should be done with a high number of repetitions, between 10 and 20. 2) The exercises should be done three times a week, with a least one day off between each workout. Here are some progressions of serratus anterior exercises for shoulder injury prevention or rehabilitation. This exercise strengthens the serratus anterior, which is responsible for both pulling the scapula forward around the rib cage and for stabilizing it. 1) Lie on your back on a bench or on the floor. 2) Hold a light dumbbell (2-5 pounds) in each hand. 3) Extend your arms so that they are vertical, with your palms turned inwards. 4) Now push your arms further up so that your shoulder blades separate. Your arms stay parallel and extended. 5) Lower your arms back to their initial position. Retract your shoulder blades and squeeze them together again. 6) Do between 10 and 20 repetitions. This exercise also strengthens the serratus anterior. It is more difficult than exercise #1, so you may want to progress to this exercise once exercise #1 becomes easy. 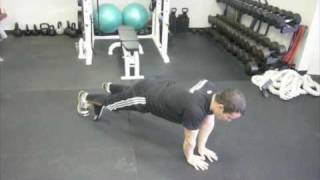 1) Position yourself in a push-up position: face down, body horizontal, hands shoulder-width apart on the floor, arms extended. 2) Your head always stays aligned with the spine. 3) Now push yourself further up by extending your shoulders to the front and squeezing your shoulder blades apart. 4) Release the shoulder blades and let gravity bring you back to the initial position. Your arms stay extended. 5) Do between 10 and 20 repetitions. If the exercise is too hard, you may want to put yourself in a less horizontal position, for example by having your feet on the floor and your hands on a bench or on a desk. This combination of three blackburns exercises is very effective to strengthen all scapular stabilizer muscles. This combination of three exercises is very effective to strengthen all scapular stabilizer muscles. 1) Lie face down on the floor. Your head rests on a towel. 2) Angle your elbows at 90°, forearms parallel to the body. Your thumbs point up. 3) Now squeeze your shoulder blades and lift your arms from the floor, then release. 4) Do between 10 and 20 repetitions. You can also do this exercise by keeping your arms straight so that they form a T-like shape with your body. Your thumbs should still point up. 5) Straighten your arms and move them towards the hips, so that the arms form an A-like shape with your body. Turn your palms up. 6) Again squeeze your shoulder blades and lift your arms away from the floor, then release. 7) Do between 10 and 20 repetitions. 8) Extend your arms in front of you so that they form a Y-like shape with your body. Turn your palms down. 9) Again squeeze your shoulder blades and lift your arms from the floor, then release. 10) Do between 10 and 20 repetitions. Once you can do 20 repetitions in one of those exercises without weights, you can add very light dumbbells (2-5 pounds) for that exercise.